Velvet Paw Creations: Santa Baby - The East Wind DT project! 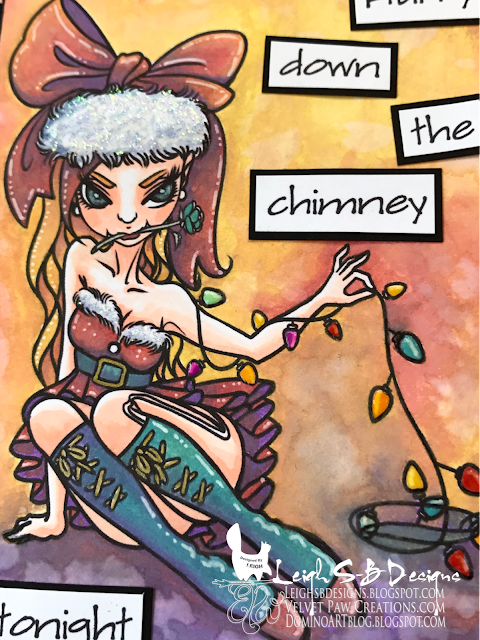 Today I'm sharing another TEW design team project showcasing Lucy Loo 'Naughty'! I've been having fun with my Distress Oxides. I painted the entire image and the background using the Distress Oxides as watercolours. I love how rich and vibrant it turned out! I sized the image in Photoshop CS6 and printed the digi out onto mixed media cardstock trimmed to 4 x 6 inches. I smeared Fossilized Amber, Fired Brick, Wild Honey, Wilted Violet and Broken China directly onto my craft sheet and applied the colours to the image using water and a paint brush and treated the ink just like traditional watercolour paint. I then added highlights with a white Dylusions paint pen and metallic gold gel pen details to her belt buckle and boot lacing. I then embellished the fluffy white areas on her hat and bodice with Diamond Stickles glitter glue and applied Inkssentials Glossy accents to the light bulbs. I typed up the text, printed out on white cardstock, trimmed and matted on black cardstock and adhered to my card with Scotch Quick Dry adhesive. I finished off by adding the black and white checkered border with black and white Dylusions paint pens..
Join The East Wind Facebook group and follow The East Wind blog for lots of inspiration! 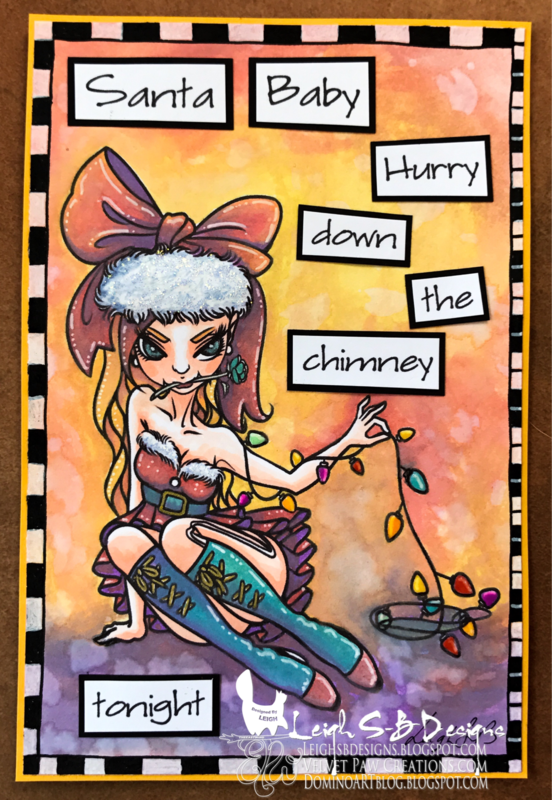 Lucy Loo is naughty and sassy, love the card....love how you coloured her and fab Oxides background!